Carlo Rovelli, a leading theoretical physicist, uses the figure of Anaximander as the starting point for an examination of scientific thinking itself: its limits, its strengths, its benefits to humankind, and its controversial relationship with religion. Anaximander, the sixth-century BC Greek philosopher, is often called the first scientist because he was the first to suggest that order in the world was due to natural forces, not supernatural ones. He is the first person known to understand that the Earth floats in space; to believe that the sun, the moon, and the stars rotate around it—seven centuries before Ptolemy; to argue that all animals came from the sea and evolved; and to posit that universal laws control all change in the world. Anaximander taught Pythagoras, who would build on Anaximander's scientific theories by applying mathematical laws to natural phenomena. 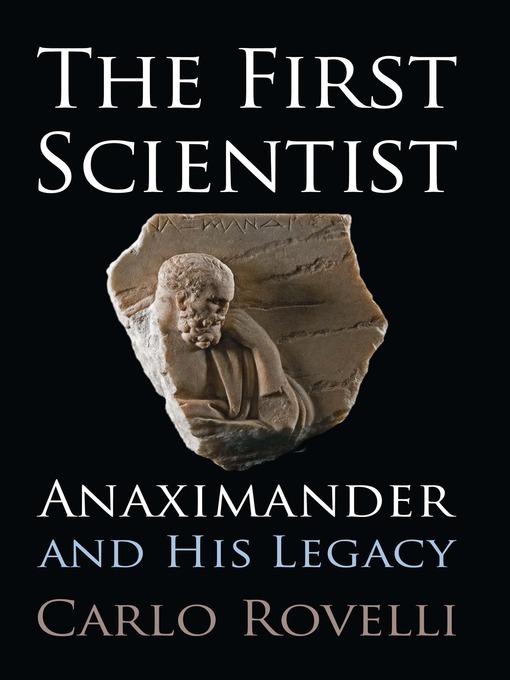 In the award-winning The First Scientist: Anaximander and His Legacy, translated here for the first time in English, Rovelli restores Anaximander to his place in the history of science by carefully reconstructing his theories from what is known to us and examining them in their historical and philosophical contexts. Rovelli demonstrates that Anaximander's discoveries and theories were decisive influences, putting Western culture on its path toward a scientific revolution. Developing this connection, Rovelli redefines science as a continuous redrawing of our conceptual image of the world. He concludes that scientific thinking—the legacy of Anaximander—is only reliable when it constantly tests the limits of our current knowledge.